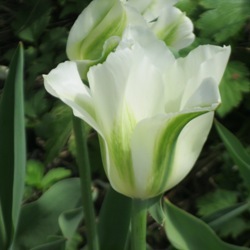 Viridiflora (Green) Tulips have petals delicately feathered with green bands or stripes on the outside of the flowers. They develop their best color in semi-shade. Early-Late May. For an artistic look in the garden. 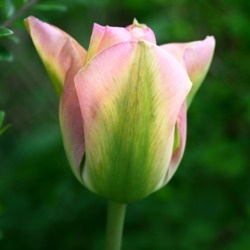 The Greenland Viridiflora Tulip (also known by its Dutch name, Groenland) is old rose in color with soft green stripes from its base to its tips. A wonderful warm/cool combination. One of the latest to bloom. Spring Green, a Viridiflora (or Green) Tulip, is delicate ivory-white with soft green featherings and light green anthers. Extremely long lasting blooms. The stems are sturdy making it an excellent cut flower for a rare floral arrangement! Our Viridiflora Tulip Collection contains 20 each of all of the above -- Esperanto, Greenland and Spring Green, individually packaged and labeled.